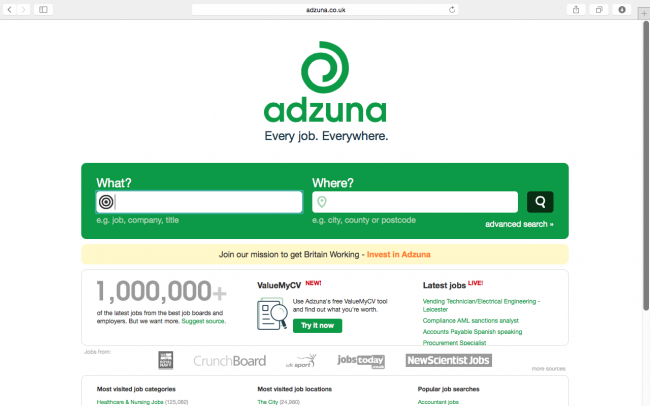 Launched in July 2011, Adzuna aims to become the world’s leading job search engine, by bringing together all the vacancies in one place and connecting users with them in new ways. The site already attracts six million visits a month and has helped hundreds of thousands of people find jobs. In addition to listing over 1m UK vacancies, the sites ‘ValueMyCV’ technology helps British jobseekers understand what they are worth in today’s job market and helps match them to better, more fulfilling careers. More than 400 ‘crowd’ investors, have backed the ‘Get Britain Working’ campaign so far ranging from CEO’s and Tech Celebrities such as Sherry Coutu (CBE) and Klaus Nyengaard (former Just Eat CEO) to university students and plumbers. The largest single investment to date is more than £200,000. The average investment size is £3,765 and the smallest amount invested is £13. Luke Lang, co-founder of Crowdcube, said: “Enabling people to invest in some of Britain’s brightest young companies, alongside world-renowned venture capital firms and acclaimed angel investors, on Crowdcube is now commonplace and vividly shows how we’ve become an accepted part of venture capital landscape in the UK. Capital raised from the campaign will be used to grow internationally and invest in Adzuna’s technology, building on a market-leading search and machine-learning platform that brings together over one million UK job ads in one place, and adds smart search options and powerful data about the job market. You can see the Adzuna pitch here www.crowdcube.com/adzuna. Please remember that investments of this nature carry risks to your capital as well as potential rewards so you should read the full pitch and associated risk warning to ensure you are #InvestAware.